We’d love your help. Let us know what’s wrong with this preview of A Year at Hotel Gondola by Nicky Pellegrino. To ask other readers questions about A Year at Hotel Gondola, please sign up. Kat though is a food writer and has agreed to write a book If you have ever wanted to feel as though you have been to Venice and stayed there for a considerable amount of time, then this is easily the book for you. Review first posted to Tea Party Princess with an additional cocktail recipe. I was completely transported to Venice as I read this book. The setting is so rich, so vivid, that I could e 5 Words: Venice, regrets, love, friendship, food. I didn't think this was one of her best, however quick easy read, enjoyed the Venice theme and especially the food, it made me want to go and try out some of the recipes. This is an enjoyable mix of Venice, romance and plenty of cooking recipes. Not quite my normal reading matter, but it is a good plot which kept me turning the pages. If nothing else it is a good reminder that when we are busy in our lives, engrossed in our work or our own pet projects, it is always important to keep talking to the person you love, letting them know what you need, or what you are missing. Communication is everything, even if feeding people delicious recipes comes a close second in This is an enjoyable mix of Venice, romance and plenty of cooking recipes. Not quite my normal reading matter, but it is a good plot which kept me turning the pages. If nothing else it is a good reminder that when we are busy in our lives, engrossed in our work or our own pet projects, it is always important to keep talking to the person you love, letting them know what you need, or what you are missing. Communication is everything, even if feeding people delicious recipes comes a close second in this book. There is plenty of sea food in this book, Venice is teaming with it throughout the seasons, and there are some great recipes which I might try at home, although not those with baby octopus which I don't see a lot of in the supermarket. Kat is a travel food writer and she's spending a year in Venice with her new love, hoping that things will develop into a happy ever after whilst providing her with lots of new material for a book. She wants Massimo to show her the Venetian Venice- but he doesn't want all their secrets shared with the tourists. She finds a wonderful vintage clothes shop, where the lovely eccentric owner finds the perfect outfit for her customers and becomes a close friend. She also makes friends with a couple of Kat is a travel food writer and she's spending a year in Venice with her new love, hoping that things will develop into a happy ever after whilst providing her with lots of new material for a book. She wants Massimo to show her the Venetian Venice- but he doesn't want all their secrets shared with the tourists. She finds a wonderful vintage clothes shop, where the lovely eccentric owner finds the perfect outfit for her customers and becomes a close friend. She also makes friends with a couple of the female guests. You can feel the stresses of running a family hotel and the constraints it places on you. Kat works there as well as finding somewhere to experiment with her new recipes. This was my languid Easter holiday treat; a light and lovely sojourn with Nicky Pellegrino’s latest. Yes there’s a formula at play here, and no this is not serious fiction, but everyone needs a break sometime and you’d be hard pressed not to secretly adore being transported to Venice for a full immersion in all that mysterious city has underneath its rich patina. As with all Nicky P’s books, there are lovely recipes here too. Delicious. Venice is portrayed in a lovely way in this book and I’m not surprised that Kat went there to write a book. I also understand she didn’t want to go somewhere that has already been discovered, ie a popular city which would be teaming with tourists. Instead she prefers off the beaten track places and always likes changing the view from her window. I’m with her on that one! Having lived the Italian dream myself for a number of years, it is always a pleasure to lose myself in a story written by an author whose passion for Italy is obvious. From the delightful way she writes about the sights and smells to the detail of including some authentic recipes in her storyline. This is the fourth novel I have read by Nicky Pellegrino, surely a good recommendation in itself. She writes in such a way that I feel myself drifting off to the world she writes about, so far always s Having lived the Italian dream myself for a number of years, it is always a pleasure to lose myself in a story written by an author whose passion for Italy is obvious. From the delightful way she writes about the sights and smells to the detail of including some authentic recipes in her storyline. This is the fourth novel I have read by Nicky Pellegrino, surely a good recommendation in itself. She writes in such a way that I feel myself drifting off to the world she writes about, so far always set in my beloved Italy, but each novel portrays a different Italian world. This time she transports us to the magical city of Venice. A novel recommended for those Italophiles that cannot resist another story set in Italy, fans of the author's writing, or indeed anyone interested in travelling via the pages of novels. I have read all of Nicky's books and would have to say this was not one of her best but in saying that I loved reading about Venice and the food made my mouth water. Kat Black has spent her career on the move as the star of a TV travel series. She's recently turned 50 and she's never had a long term relationship. But the milestone birthday has made her realise that she has maybe twenty more "good years" and it's time to make some changes. So she moves to Venice to live with Massimo, the handsome hotelier whom she's been seeing at long distance for a few months. She has committed to spending a year in Venice, working at the hotel with Massimo and writing an " Kat Black has spent her career on the move as the star of a TV travel series. She's recently turned 50 and she's never had a long term relationship. But the milestone birthday has made her realise that she has maybe twenty more "good years" and it's time to make some changes. So she moves to Venice to live with Massimo, the handsome hotelier whom she's been seeing at long distance for a few months. She has committed to spending a year in Venice, working at the hotel with Massimo and writing an "Eat, Pray, Love" type memoir about the experience. What she hasn't factored in is how difficult it will be to transition from a nomadic lifestyle to a settled one where every day is essentially the same, and to living with someone for the first time ever. In my humble opinion this isn't Nicky's best work. I found the story hard to get into - I don't think the two different perspectives helped. I didn't warm to Kat much either, and she was the main character! There wasn't much in the way of romance. As for the other characters, Massimo was a bit wooden, but I loved Coco. At times I found this book - and the exploration of ageing - a bit depressing. But I loved the descriptions of Venice. Nicky does this very well, along with descriptions of food. In my humble opinion this isn't Nicky's best work. I found the story hard to get into - I don't think the two different perspectives helped. I didn't warm to Kat much either, and she was the main character! There wasn't much in the way of romance. As for the other characters, Massimo was a bit wooden, but I loved Coco. At times I found this book - and the exploration of ageing - a bit depressing. But I loved the descriptions of Venice. Nicky does this very well, along with descriptions of food. So I kept reading and I think the ending was satisfying. In my opinion this book was mediocre. It wasn't unbearable to read, but it wasn't the easiest either. The book was written in a way in which one chapter was written in third person and the next chapter was main character writing her own novel - it took a little bit of getting used to at first. I didn't relate much to the protagonist Kat Black, partly because of her age. My first impressions of her were that she was a bit of a snob, stubborn and likes things her way or the high way. Her sense of a In my opinion this book was mediocre. It wasn't unbearable to read, but it wasn't the easiest either. The book was written in a way in which one chapter was written in third person and the next chapter was main character writing her own novel - it took a little bit of getting used to at first. I didn't relate much to the protagonist Kat Black, partly because of her age. My first impressions of her were that she was a bit of a snob, stubborn and likes things her way or the high way. Her sense of adventure and perspective of life reminded me of an ex lover of mine so that wasn't particularly great but that's a personal opinion. Kat always seems to want more than what she's got and she does come across as a selfish character. However, towards the end she begins to realise this and learns a few life lessons. Personally, if I was reading Kats book the random recipes would irritate me as they disrupt the flow of reading. The character Coco and her flamboyant personality made the book for me, without her I don't think I would of got through the book. She added flare and excitement which engaged me as a reader. I feel Venice was the main character in this lovely novel ;) and as all of Nicky Pellegrino's books it is filled interesting characters and heart warming stories. I do feel though that Kat ( the female main character) was ( to me anyway) a touch shallow and she irritated me at times. But who says the main character has to be perfect ? ;) I will re read this novel again with joy. 3.5 stars. Pleasant read, especially if you're interested in Venice. A lot of good detail about the city. Appreciated seeing an older character get a story with a love interest and not have it be about empty nest syndrome or a failed marriage...I like those books for sure, but it was nice to read a story about someone who'd reached 50 without having done all that. It was different. Having said that I found Kat to be a bit childish for a woman her age, but maybe that was the point? It's hard to k 3.5 stars. Pleasant read, especially if you're interested in Venice. A lot of good detail about the city. Appreciated seeing an older character get a story with a love interest and not have it be about empty nest syndrome or a failed marriage...I like those books for sure, but it was nice to read a story about someone who'd reached 50 without having done all that. It was different. A lovely gentle read that carries you along without any peaks or troughs of high drama. Again Nicky combines the successful elements of Italy, Italian romance and food seen through the eyes of Kat who is in Italy for a year of writing and seeing if a relationship with an Italian man will work. So we are both reading the chapters that Kat writes and reading the chapters through Kat's eyes of her everyday life. Spending most of her time by herself trying to uncover the hidden Venice, Kat makes new f A lovely gentle read that carries you along without any peaks or troughs of high drama. Spending most of her time by herself trying to uncover the hidden Venice, Kat makes new friends....all adding a rich tapestry to her life. And making the unexpected the norm. Needless to say, when you least expect it, life throws curveballs and I enjoyed reading right to the end of the book to see road Kat will take after her year has passed. Life is too short...make a party of it everyday. Kat is a travel writer who has travelled the world but has recently had her TV show cancelled. So she is at a bit of a loose end and needs to come up with an idea. She travels to Venice and decides to stay for 12 months as she meets Massimo, owner of Hotel Gondola. Pellegrino brings Venice to life through her descriptions of the places that Kat explores as well as the food that she makes and tastes. The book is presented in two alternating ways - you get excerpts of the book that she is writing Kat is a travel writer who has travelled the world but has recently had her TV show cancelled. So she is at a bit of a loose end and needs to come up with an idea. She travels to Venice and decides to stay for 12 months as she meets Massimo, owner of Hotel Gondola. The book is presented in two alternating ways - you get excerpts of the book that she is writing as well as her thoughts on how she is coping with living in Venice. There are several enjoyable characters that are included within the book who Kat interacts with. They say you’ve never been to Venice until you’ve gotten lost there. Nicky Pellegrino’s breezy romance novel does offer some opportunities to do just that. She captures the real Venice – from the hustle and bustle of the tourist hotspots to the places the locals love. 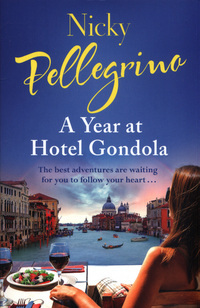 A Year at Hotel Gondola is the tenth novel from this journalist and it is a pleasant and at times rather indulgent Italian affair. I liked the self awareness the main character [Kat aged 50 then 51] built as the year went on and learning about the locals' side of Venice...... and the food. And the escapism. I didn't like the repetition of her experiences which were being used to build up a book as they weren't different enough from her own experiences and were a bit wooden in their execution. Nice summer read. I loved the idea of the two stories sitting next to each other. Towards the end the storyline got a whole lot better. In the beginning, especially, I got the feeling it wasn't finished. How the two got together in the first place, remained a bit of a mystery. Only just a 3. I certainly didn't enjoy this story as much as others by the same author. Found it a bit disjointed with the two stories running along together, it was quite slow and really didn't "achieve" anything. Although this book took some getting into, I really enjoyed it, and was soon wanting to find out what happens next! It was set in Venice and made the place come alive. A good heartwarming romance. I liked how this was a book within a book and with an older romance. I have always loved Nicky Pellegrino’s writing. Good summer read, feel like I've visited Venice now! Excellent! Just like 'good housekeeping' said "a slice of pure sunshine"! A book within a book, a lovely story of Venice, food and it’s wonderful characters. Everyone should have a Coco in their life. Reading a story by Nicky Pellegrino is like going on holiday in a book. An enjoyable escapist book set in Venice. Unlike some others I quite enjoyed the dual story telling.